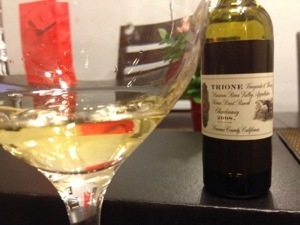 I had some more Tasting Room samples from Trione so I cracked them open to see what was doing. 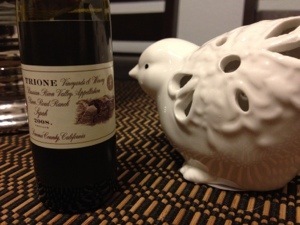 The Trione 2008 Russian River Valley Pinot Noir is open-top fermented, and is a blend of three clones (115, 667, and 777). It’s got that light elegance that I really enjoy in a Russian River Valley Pinot Noir. There are some really tasty mushroom flavors in this wine. 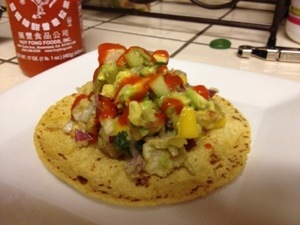 The Ceviche Tacos bring out a nice peppery note in the wine. This is a solid 89 point wine at $35. 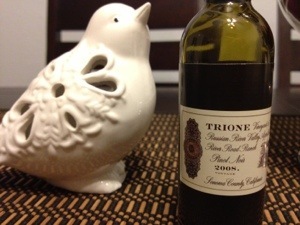 Quite a bit of the Trione 2008 Russian River Valley Syrah is fermented as whole berry clusters in open top fermenters. The Syrah is hand-plunged up to four times a day. This is not your standard warm-climate Syrah. The cool Russian River Valley reels in the sometimes over-extracted fruit. The palate is full of yummy cherries and earthy tobacco. The Ceviche Tacos highlight a plumminess in the wine. At 90 points, this $32 Syrah is well worth it. What wine would you pair with Ceviche Tacos? Leave a comment, and let us know. 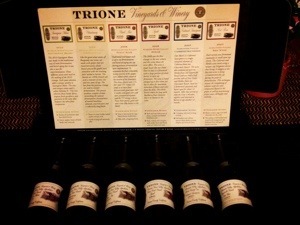 A few weeks back, the fine folks at Trione Vineyards & Winery contacted me to see if I wanted to sample their wine. Early last week a package from TastingRoom.com arrived at my door. 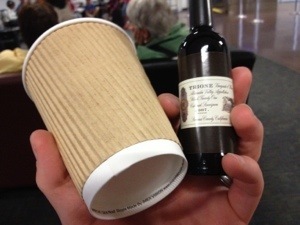 Inside were six 50 ml samples from Trione. Surely, when a grand total of 300 ml (less than half a bottle) of wine is placed before you, one could be tempted to taste them all in one sitting. However… with the diversity of styles, I figured it would be a better idea to taste them two at a time. The other day, Kara came home with a wicked cold. While Kara was nursing herself back to health with her Vegetable Pho, I paired my Spicy Beef Pho with the first two wines from the Trione set. 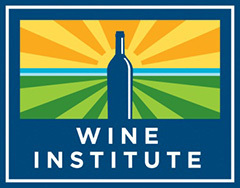 The 2010 Sauvignon Blanc was tank-fermented and barrel-aged. It used a mixture of three different yeasts for fermentation, including the South African Alchemy II in order to impart a grassy characteristic. It retails at $23. Color: Pale. 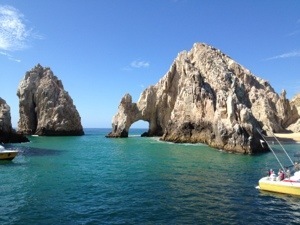 I mean… look at it. It is a Sauvignon Blanc after all. Nose: Crisp lemon and grapefruit notes to go with a nice minerality. 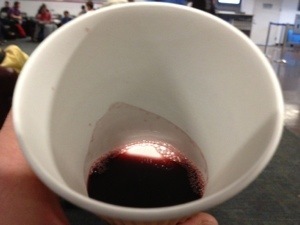 Palate: There’s a good viscosity to this wine. It is grassy, but not in an over-the-top type of sense. Nice tropical fruit flavors transition into a crisp acidity. With the Pho: This wine begs for spicy Asian food. 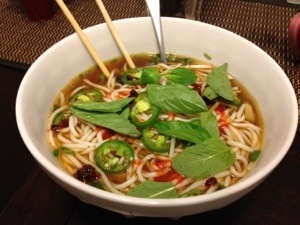 The heat from the Pho helps in highlighting some big grapefruit flavors and minerality in the wine. Score: 89 points for this one. Nerdier than your average Sauvignon Blanc… At 23 bucks, this wine is just interesting enough to make it worth it. These grapes were hand-harvested and whole-bunch pressed before transfer to new and used French oak. They used the lees from the previous vintage to get fermentation started. I’m pretty sure that’s the same process that Dave TheVegetarian uses to make bread dough. It retails for $30. Color: On the pale side of golden-yellow. Nose: This wine is straight up butterscotch and popcorn. Depending on who you are, this could be a great thing. Palate: To those of you that love buttery Chardonnays, this is the wine for you. All butter, but not in a goopy sort of way. There’s a nice, crisp green apple frutiness and acidity. 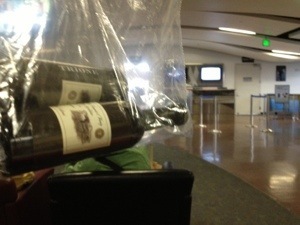 With the Pho: Upon tasting the wine, I was fearful that the pairing would be a disaster. When’s the last time you had Pho with a side of buttered bread? That being said, the wine did not overwhelm the Pho. The soup actually highlighted some surprisingly enjoyable green caramel apple flavors in the wine. 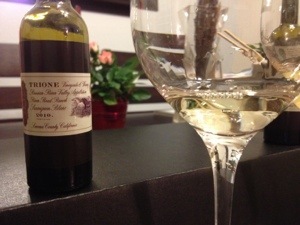 Have you ever had Trione before? What’s your favorite wine and Pho pairing? Who makes your favorite Californina Sauvignon Blanc? What’s your go-to wine region for Chardonnay? Have you ever used TastingRoom.com? Leave a comment, and let us know.